One Za’abeel ... towers connected by the world’s largest cantilever. Work has started on One Za’abeel, an iconic new high-rise mixed development that will tower over Zabeel Park in Dubai, UAE. 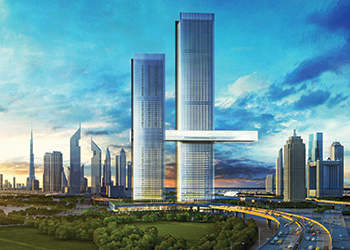 Located on Sheikh Zayed Road, One Za’abeel is a mixed-used development comprising two skyscrapers linked by what is described as the world’s largest cantilever, floating 100 m above the ground. One tower rises 67 floors and the other 55 floors. They will rise over a three-level retail podium that is dissected by the highway, and a seven-floor basement. The project is being developed by Ithra Dubai, the real estate arm of the state-owned owned by Investment Corporation of Dubai (ICD). Main contractor Al Jaber Engineering and Contracting (Alec) has completed site excavation, preparatory works, shoring and piling on the site and now begun construction of the basement. Covering a total built-up area of 480,000 sq m, the project will have 37,000 sq m office space, 12,000 sq m of retail, a 90-key ultra luxury hotel, a 314-key luxury hotel, 94 serviced apartment, 263 residential apartments and 2,500 parking spaces. The retail podium will be known as The Gallery, while the panoramic cantilevered sky concourse, which connects the two towers 100 m above the ground, will be called The Linx. The project was named One Za’abeel as it carries the address 1 Za’abeel, located between the old and new business districts of Dubai on Sheikh Zayed Road.